MinerEU is now offering to its customers from Europe some of the Rockminer SHA-256 ASIC miners available at attractive prices and shipped from UK, so no extra taxes need to be paid. The small 100-110 GHS Rockminer RBOX miners are available for $145 USD new, the 480-510 GHS Rockminer R4 used are available for $190 USD and used Rockminer T1’s with 780-840 GHS are being sold for $330 USD. 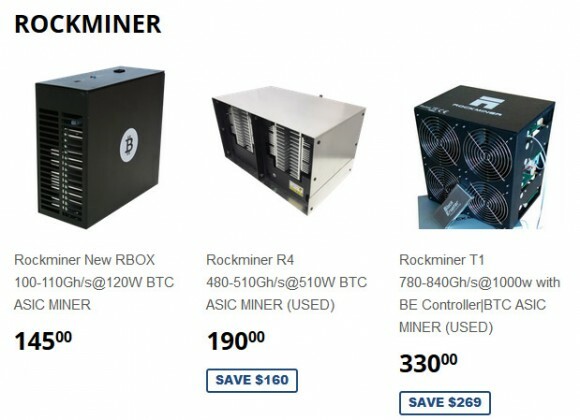 The prices are good for the Rockminer ASICs, however do note that they do not come with a PSU and with a power usage of about 1W per GHS they are already not so adequate for long term mining, unless of course you do not pay the electricity bill. With their hashrate the Rockminer ASICs could be more interesting for people that want to get one for playing with it, not with the idea to use it for mining for profit. ZeusMiner is making ASIC Scrypt miners, however it seems that the company is also interested in offering Bitcoin mining hardware as well and as a result they have announced a partnership with a well-established brand in BTC mining – Rockminer. As a result of this partnership between the two companies you can purchase the 800 GHS Rockminer T1 ASIC miner at a price of just $369 USD, a nice deal if you are looking to invest in SHA-256 mining hardware. The Rockminer T1 is rated to provide 780-840 GHS hashrate with a power usage of about 1000 Watts, do note that the miner does not come with a PSU included, so you will need to buy it separately and unfortunately this adds extra cost if you don’t yet have a powerful PSU available. Do note that ZeusMiner does ship from China, it is not yet clear if the distributors of Zeus will also be offering Rockchip miners and if the price will be as good.